Soak up the city’s medieval charm and scents of spiced mulled wine this season, as fairs, family fun and festival flavours transform York into a festive fairy-tale. Discover the delights of the iconic St Nicholas Fair, immersed in tradition and bustling with activity, the historic streets of York come alive during the wonderful winter months. 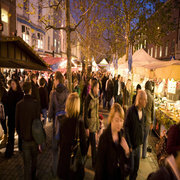 Meander through the magical market stalls in a truly special shopping experience. Prices are for return coach travel only and do not include entry to any attractions.